Accomplished second single from one of 2005's most impressive new bands. 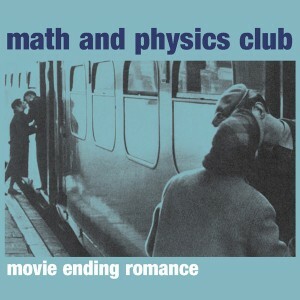 The initial pressing of the debut Math and Physics Club EP 'Weekends Away' sold out immediately, thanks in part to tremendous support from hip radio stations KEXP and WOXY plus a groundswell of underground buzz around the band. In reviewing the EP, venerable music publications pulled out all the punches, with All Music Guide calling it "a four track gem that manages to escape any charges of imitation," Losing Today concluding "a classic all said and done," Pitchfork reporting "sounds like The Clientele performing the first Smiths record after a Saturday night alone with Go-Betweens b-sides," and Splendid hailing Math and Physics Club "a great new band." With this new EP, the Seattle quintet proves the success of its debut was no fluke. Lead track 'Movie Ending Romance' is one of those seamless summertime janglers with soaring guitars, lots of tambourines and a precise drumbeat that will put a skip in the step of indie hipsters across the globe. 'White and Grey' is an earnest song featuring exquisite strings, keyboards, and wailing harmonica plus some magnificently poignant vocals. 'Graduation Day' is a swinging pop hit with more jangling guitars, tambourine, violin, and great lyrics—perfect for summertime beach parties and a possible contender as the best MAPC song to date. Closing track 'You're So Good To Me' is a Pacific Northwest take on a Beach Boys classic and a mighty fine one at that. While recalling some of the best bands of yesterday, Math and Physics Club have secured a spot for themselves among today's indie elite. Demonstrating increasingly impressive songwriting, these four new songs should help to solidify them as one of the best discoveries of 2005. The band is currently working on its debut full-length scheduled for release early next year. Limited to 2000 copies in custom minijacket sleeve.